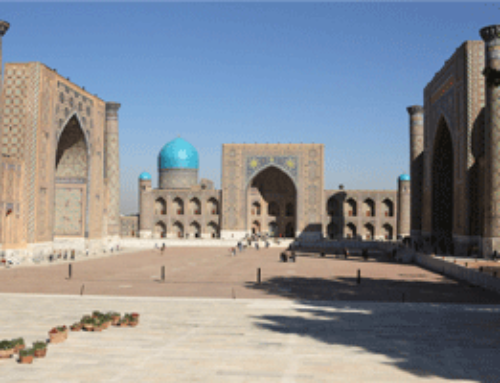 We begin in this capital city, where you are first introduced to the charming culture of Uzbekistan. City sightseeing in Tashkent will include a visit to Hast Imam architectural complex, the Museum of Applied Arts and the State Art Museum to see embroideries and other fine crafts, visit Abdul Khasim Medrassah with its hujra cells used as metalwork craft workshops to produce jewelry and other goods. Lunch at a nice local restaurant. After lunch we’ll visit the exciting Chor-Su market to see cradles, hand-made musical instruments, and fruit and vegetable market. 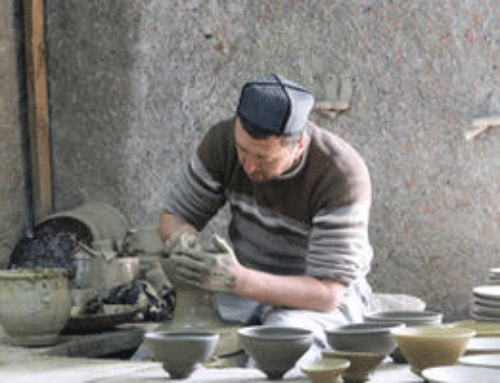 After our visit to the market we will drive to the workshop of Akbar Rakhimov, a local potter and one of the most noted ceramic artists in the country. We will be able to see the colorful traditional ceramics in his museum. In the evening enjoy a Welcome Dinner of traditional Uzbek dishes. After breakfast depart by road on to legendary Samarkand, the grand capital of the emperor Tamerlane. The road goes through Tashkent, Syrdarya region and mountainous countryside of Jizzakh region of Uzbekistan where you may want to make spontaneous stops for photographing. After arriving and checking in a hotel lunch at a nice local restaurant. After lunch drive to the actual site of the ancient city of Afrosiab, and after visiting the excavation with the archeologist and director of the museum, visit the Afrosiab Museum with its excellent collection of treasures from the site. Dinner at a local restaurant. Overnight in Samarkand. This morning, visit the great central square of Samarkand, the Registan. 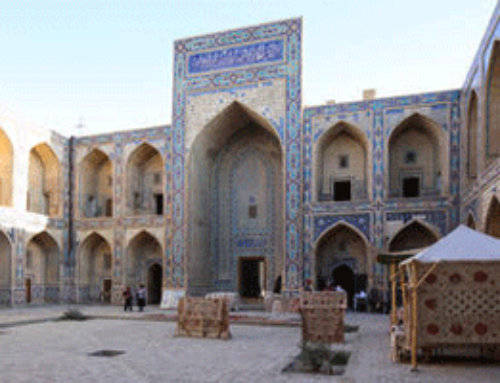 Continue to Gur-Emir, where Tamerlane is buried, to Bibi-Khanum Mosque and also visit the nearby market. After lunch visit Shakhi -Zinda ensemble of the Mausoleums. This unusual necropolis has monuments of the 14th and 15th centuries, reflecting the development of the monumental art and architecture of the Timurid dynasty. Dinner at a local restaurant and overnight in Samarkand. After breakfast we’ll drive on to holy Bukhara making a stop in Gijduvan to visit the most important ceramic center of Bukhara region. If we’re lucky we’ll have the opportunity to see centuries old tradition of using a donkey for spinning the millstones during the process of natural dyes grinding. Lunch at the local potter’s home. Continue afternoon drive on to Bukhara. Arrive in Bukhara early evening. Dinner at the hotel or at a local history. After breakfast we’ll start full day walking tour of Bukhara to include a visit to the 2000 year-old Fortress Ark where Emirs once lived. Visit Poi-Kalon, or “Pedestal of the Great”, the heart and focal point of all Bukhara then continue to the Ismail Samani Mausoleum, dating from the early 10th century and to Chashma Ayub – the Spring of Job, where according to the old Testament, Job caused water to gush from the desert. After lunch in a local teahouse or restaurant, continue sightseeing to Magoki – Attori mosque, dating from 12th century, Medressahs of Ulug-Bek and Abdul-Aziz Khan, Visit Magoki – Attori mosque, dating from 12th century, Medrasahs of Ulug Bek and Abdul-Asis Khan. You will also see Lyabi-Khaus otherwise known as The Shore of the Pool, an architectural complex consisting of the 16th century medrassah and a mosque and the nearby dome covered markets. Dinner and folk program in an old Medrassah. After breakfast we’ll continue our drive to Khiva, the last great oasis on the old caravan route that will lead us through the Kizil Kum (Red Sands) desert to this remote desert city. Lunch stop on the road. Continue drive to Khiva and arrive late afternoon. The rest of the day we’ll do some walking sightseeing of old Khiva. 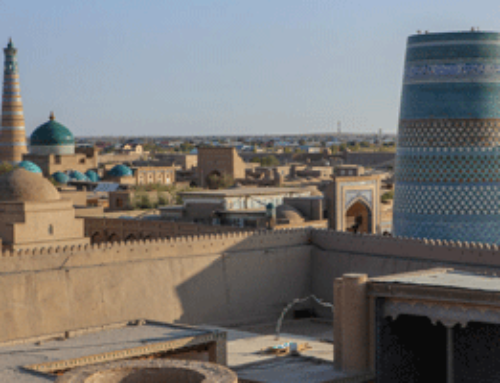 Traditional dinner and overnight in Khiva. After breakfast you’re welcome to continue sightseeing of Khiva, the most intact and remote city of Central Asia. Experience the richness of this museum city that houses the most homogenous collection of architecture in the Islamic world. Drive to Urgench (capital of Khoresm region) to depart for Tashkent by air. Upon arrival in Tashkent we’ll visit the exciting Chor-Su market to see cradles, hand-made musical instruments, and fruit and vegetable market. To conclude the journey, we’ll have a final feast of Uzbek national dishes and farewell toasts. Early this morning we will transfer to the airport for our flights home.